Regular readers know that I love me some grindcore splits. It's a great way to check out new stuff from bands you love as well as be exposed to groups you might have never otherwise heard of. Such is the case with this Birdflesh/Organ Dealer split. 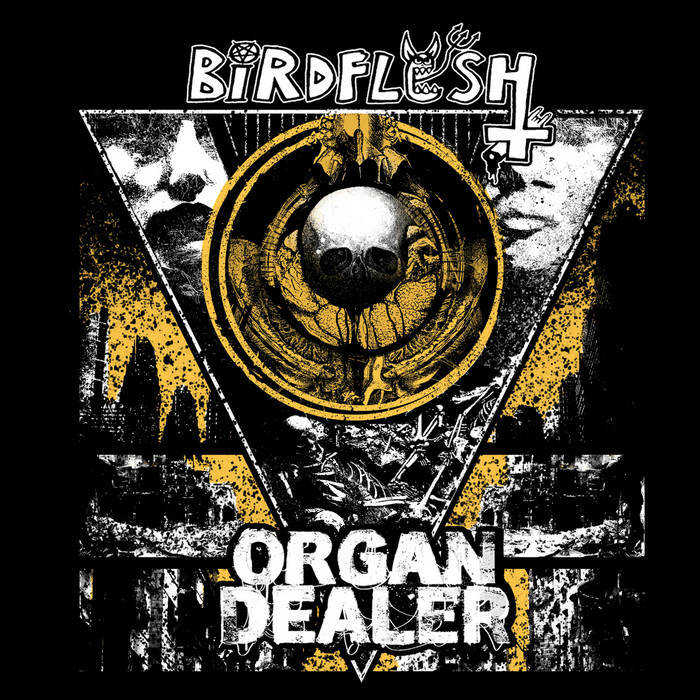 Birdflesh are a band I was only familiar with in passing, and pleasantly surprised by, and Organ Dealer are local favorites who have been melting my face off with vicious live shows ever since I moved to America. This split brings together two potent acts for something truly special. Birdflesh's half of this 12 inch is reflective of their career. It's stripped down under produced grindcore with sick riffs and dementedly funny lyrics. They careen along with a sort of bloodthirsty bliss. While I certainly would love to hear an enhanced Birdflesh with better guitar tones and productions, the inherent rawness is in and of itself endearing. However it's Organ Dealer who really steal the show on this release. Their 9 tracks tear you limb from limb, a non stop sonic assault that perfectly represents the inherently demented magic of this music. They are a band who truly understand the power of grind and I feel that this record justifies my obsession. There is a certain manic energy that both groups on this split embody. A dedication to the punkier side of grindcore, but also to reminding us why we spend so much time getting bloody in pits in basements across the world. The fact that two bands can be united from across an ocean as they were on this record is always exciting to me, especially when they manage to put together a piece of art this potent. If you're not a grind freak, you probably won't get it, but if you are, this might just be on your year end list.